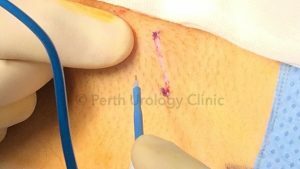 Microsurgical denervation of the spermatic cord, or ‘cord stripping’ is a relatively new procedure which can permanently treat chronic testicular pain in those who have exhausted all other options. 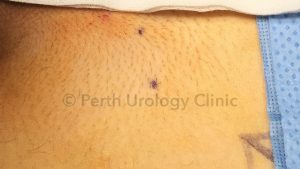 Dr Barrett at Perth Urology Clinic has the largest experience with Microsurgical Denervation in Western Australia. Chronic scrotal pain is a common condition that poses a unique set of challenges to the patient and the surgeon. There can be a physical cause within the scrotum or the pain can be a reflection of a disease process elsewhere (for example hip pain or back pain). Most commonly however the cause is not identified and this can lead to a frustrating impasse between patient and surgeon. Neuropathic pain can persist long after an initiating physical insult has healed. Chronic pain should always be managed in a stepwise and multidisciplinary fashion with opinions from a pain specialist, physiotherapist and even a psychologist with a trial of all conservative options before surgery is considered. If a physical problem is identified (varicocele, post vasectomy congestion) then surgery can be offered to treat that problem. Before the introduction of microsurgical denervation, urological surgery for pain would involve removal of the epididymus or the testicle. These operations were not ideal with success rates as low as 10% in some studies. The basis for the operation of microsurgical denervation is that the testicle is connected to the body through the spermatic cord. This can be though of as a sheath of cables. 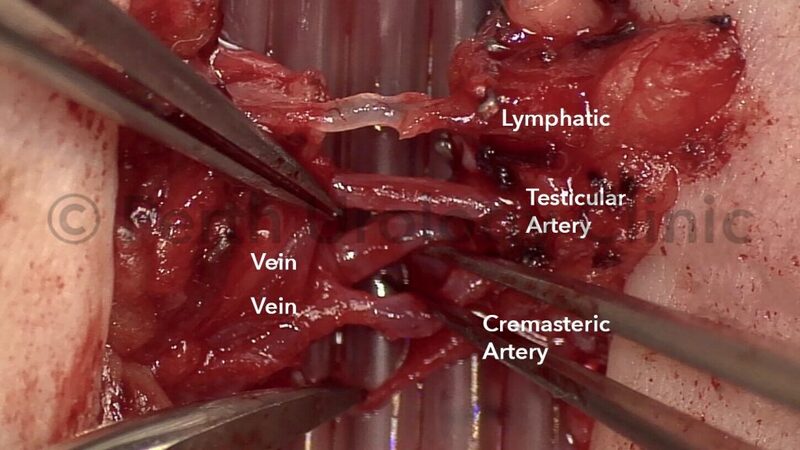 Within this sheath (and amongst its ‘cables’) are the blood supply (arteries and veins), sperm drainage (vas deferens), muscle fibres and lymphatic channels. Intertwined amongst these vital structures are the nerves that carry sensation to and from the testicle. Regardless of the underlying cause of pain, the pain signals are travelling through the spermatic cord and therefore disrupting this pathway can interrupt the pain signals. The nerves themselves are not clearly visible even under a microscope and the denervation procedure aims to preserve the essential cables (and therefore keep the testicle alive) whilst dividing anything which is not essential to keep the testicle alive and may be carrying nerve signals. A local anaesthetic cord block temporarily blocks the pain signals within the cord and is a strong predictor of success with denervation. If there is no response to a cord block, it is likely that the pain is coming from somewhere other than the testicle and other options should be considered. A cord block is required prior to a denervation and is performed in the rooms using a small needle under local anaesthetic. Pain scores will be recorded before and after the block. The microsurgical denervation of the cord is performed through a small groin (subinguinal) incision. Through this incision the spermatic cord can be delivered. The cord is then opened under a microscope and its contents can be examined. Over a few hours with meticulous care the cord is skeletonised, or stripped so that only essential structures remain. This usually includes between 1-4 arteries, a vein and a lymphatic vessel. The vas deferens is preferentially divided as there are a large number of nerves on its surface. The ilioinguinal nerve is ideally divided. At the end of the procedure the wound is closed after injection with local anaesthetic. A patient will generally stay overnight and be discharged the next morning. Activity needs to be limited for 4-6 weeks. The result of a successful denervation should be a resolution or improvement in scrotal pain. Because all the nerves have been cut the testicle itself should be numb within the scrotum. There may be reduced sensation on a patch of skin on the scrotum and inner thigh if the ilioinguinal nerve is divided. Worldwide series report excellent long term results in carefully selected patients undergoing microsurgical denervation. Approximately 70% of patients will have compete relief with another 17% reporting an improvement of more than 50% (Strom and Levine 2008). There are some significant risks related to the procedure such as damage to the testicle, loss of the testicle and hydrocele formation but these are thankfully very rare.